The Invicta 89280B Pro Diver Collection 23k Gold-Plated and Stainless Steel two tone Automatic Watch is big in everything it does, including the name. Unlike many Invicta watches, the movement is Japanese not Swiss. The 89280B is powered by the wearer’s own movement. As such it is a watch for every day, and for the large part of each day too. Without regular wearing, it can start to lose time, but it can be adjusted. So unlike the Invicta Men’s 0072 or Invicta Men’s 8932, it is not an occasional watch, it is an every occasion watch. The 89280B is affordable. It is in fact cheaper than a professional clean of say a Rolex, but is held out to be as impressive. Many customer reviews hold it out as “big and bold”, or “great value”, but words such as “Impact” and “Impressive” suggest it brings more to the table than you might think. The 89280B like most of the Invicta range, is large. It has a silver colored strap, with gold plated centre links. 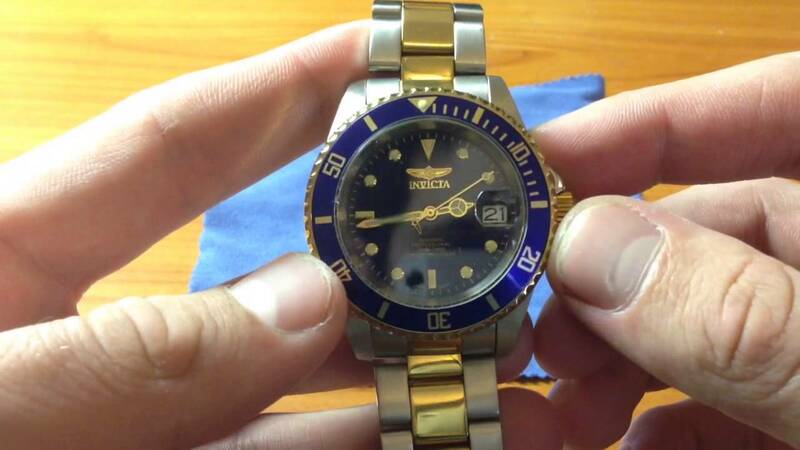 It has a stunning blue face and unidirectional blue bezel. A basic three hand watch with the date display at 3 pm, the date has a magnifying bubble to assist viewing, akin to a Rolex in that way. The bubble is a positive piece of detailing design and build. The watch works under water to 200 meters, and the coloration on the strap and face give it a touch of class, without being unnecessarily garish or ostentatious. This timepiece is not for the quiet understated type, in size alone it makes an impact. You will also be wearing it most of the day too if you want it to keep good time. This may prove too much for some. 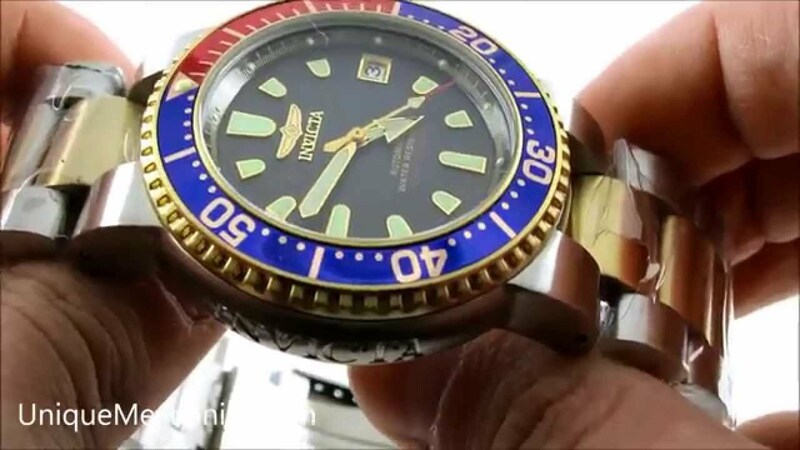 We have a “cheap” watch with Japanese components and some gold-plating. 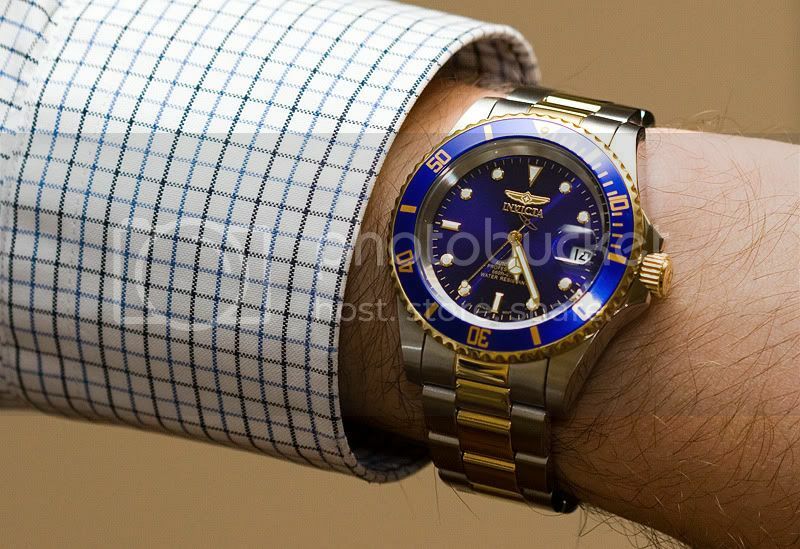 The trim is slightly fussy because of this, but the blue face and bezel are fitting and fetching. The watch feels and looks well made. With a clever see through back, 200 meter dive capability and a battery free watch, means there are perhaps more pluses than first thought. Is it affordable luxury, is it luxury at all? The lack of Swiss components may cause some to question build quality. It is a big, bold watch, but lacks the bonus of chronographs. It has a viewing back, but I am not sure if that is a bonus or not for if you take the watch off often enough to look, it will stop due to it not being worn. A strange dichotomy. If you want an affordable, great value watch, that looks good, but not too garish, this is a great option. If you are prepared to have only one watch and wear this large watch all the time, or put up with the manual reset, then the 89280B may be for you. What looks good and feels right today, may be unfashionable after a good sleep. Do not chase trends, set them. Find a watch that fits, and stick with it. By fit, I mean not only in the physical sense but also with your lifestyle, work and recreational time. I like the silver coloration and blue face/bezel, therefore this watch looks good. However, 23k or not, the gold centre links spoil the overall aesthetic of the watch. I like the view bubble over the date and the see through back, should I ever have the need to watch time pass by. Both of these are clever little nods to quality usually associated with much more expensive watches. I do think the gold is one step too many though, I feel this brings a little too much color to the table. Talking of steps, then you may find yourself taking the stairs and not the lift, just to keep good time. I love the idea of perpetual motion, but if you are naturally inert or prone to stillness, it may not be the best watch for you, plus, because it is so big, you may end up swapping arms from time to time. The watch is a “Big-Impact”. It is big, bold and masculine. It is a round faced with a simple unidirectional bezel. The hands are luminous and the date can be found at 3 pm with an added view bubble. Buyers get Japanese movements and there is no criticism of the mechanisms, only the “wear-time” needed. Its band is a standard gentleman’s size. 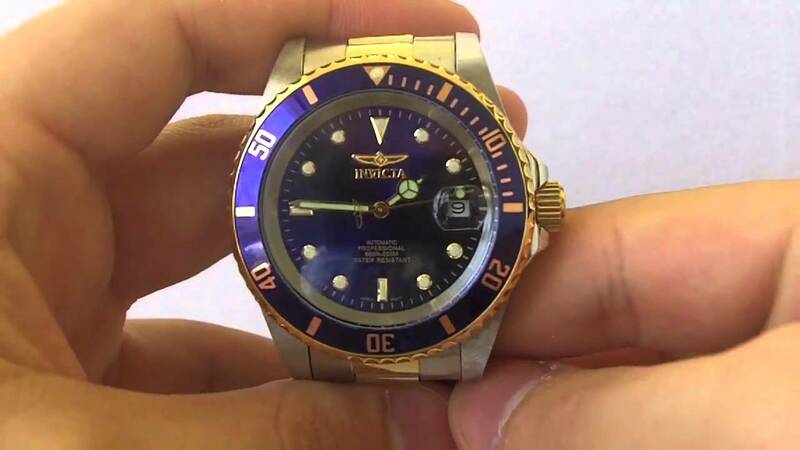 It has a stunning blue face and bezel which is unidirectional. It is competitively priced which may surprise anyone looking at it, not that you would tell them though if they asked. A little fussy in looks, it has a see-through back, but lacks extras such as chronographs. The coloration of the strap, bezel and face looks a little thrown together, rather than designed. 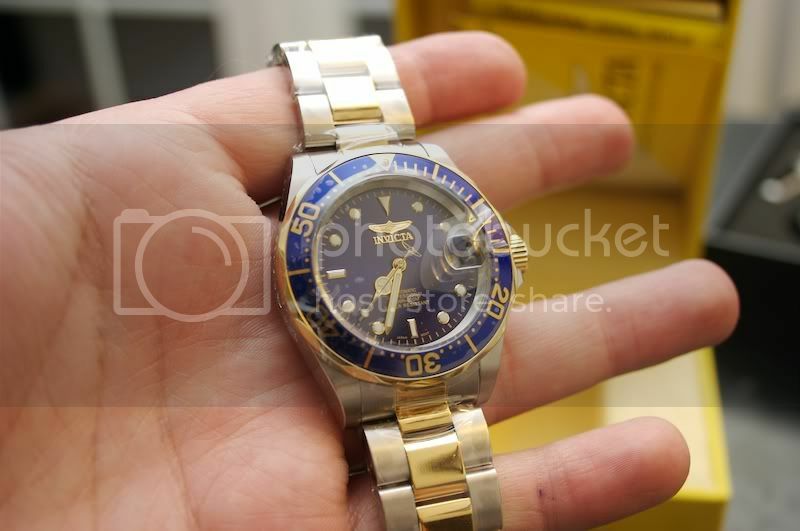 Reviewers have held it out to be Rolex-like in appearance, the bubble date and size and weight etc. yet the cost is less than you may pay to have a Rolex professionally cleaned. It is an Impact Watch, if you’re trying to make one. Size and weight however go against it when it has to be worn most of every day to keep good time. You either learn to live with this or to accept having to set the time regularly. The choice is one or the other. Do you want one? If you buy it then you have to wear it. If you don’t wear it all the time then you will have to accept it will need to be adjusted every outing. Is this acceptable? An everyday watch which is so big? I think yes, and many agree. The benefit of other Invicta watches may be the battery, as they can then be occasional watches. The 89280B can be this too, but only if it is adjusted on wearing. It is for the individual to decide if this is acceptable. Personally I wouldn’t worry about it. Is this a “luxury” watch? I am not convinced, but what is luxury, reliability, exclusivity, history? It is a subjective call. It is affordable, it has great value, some style and will get noticed. It has also been an extremely popular purchase. This watch will definitely get attention, and people will comment. If you want this, the watch will deliver. If not, then it may not be for you. If you want an affordable, great value watch, that looks good, but not too garish, this is a great option. If you are prepared to have only one watch and wear this large watch all the time, or put up with the manual reset, then the 89280B may be for you. I don’t like unprompted conversations so the 89280B is not one I would pick. Yet I do love the perpetual motion battery free life and am not put off by the need to wear it most of the time, I just don’t want people to ask me about it. I’ll stay quietly in the corner thank you.